Smash Shot of the Day: Shoryuken! Today's screenshot is taken from the 3DS version of the new Smash game we're all waiting for! Sakurai states that the duo are performing their strong up attack - the standard A up tilt prompts both characters to attack at the same time if a Luma has been summoned. 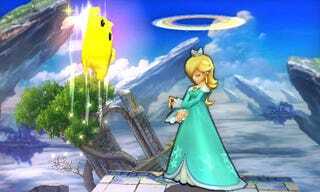 Luma performs an air-splitting uppercut while Rosalina produces a "Saturnian Ring". The latter of the two as seen in the image is probably presented in early frames of the attack, because it looks like Rosalina's doing...nothing. At the very least, Rosalina is going to have some crowd control with her physicals if her moves continue to play out like this.